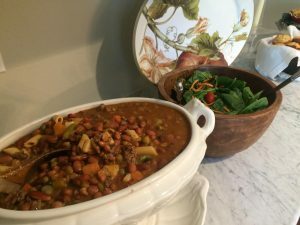 A couple of weeks ago, I blogged about a topic that seemed to resonate with and encourage many people – the topic of the dinner table. In our culture, in many ways, the dinner table seems to be going the way of the dinosaurs and is on its way to slow and gradual extinction. To fight for its importance and centrality in our homes, and to encourage one another in our struggle to keep it as a regular part of our weekly rhythm and routine, I thought it would be fun to step together into the classroom of the greatest teacher I know on the subject – my mom. 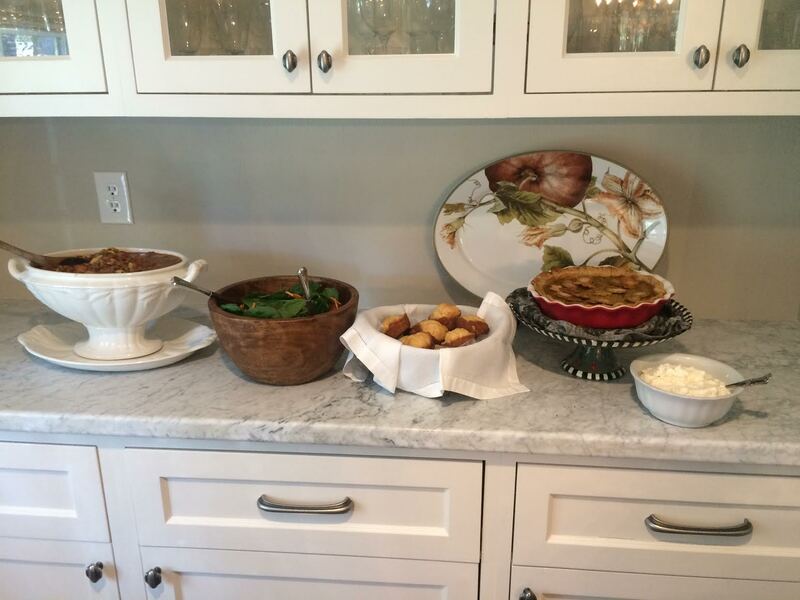 When I was growing up, it wasn’t a secret around the Ince household that my mom was an excellent cook…and I was not. Family lore includes many stories of my mishaps in the kitchen, including the time I was left to watch the broccoli on the stove, decided to pick up the book, The Robe, and became so absorbed in its pages that not only did I burn the entire head of broccoli to a crisp but charred the entire top of the white rental house stove as well. It took days of scrubbing to remove the blackened remains (I’m still sorry, dad). All that to say, a chef I am not. I’ve always preferred books to spatulas, but my mom can turn any ingredients into a feast, and the place where she shines the brightest is in her kitchen and around her table. So I thought my mom and I could periodically team up to do what each one of us does best – mom can set a beautiful table, cook a delicious meal, and I can put it all into words. 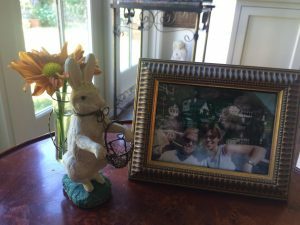 So, welcome to the first official entry of the blog series we’re going to call My Mother’s Table. Each entry will consist of a menu, the recipes to go along with it, pictures of her beautiful table, directions for us to follow to make our tables beautiful as well, and a devotional thought to go along with it all (that’s my small part). 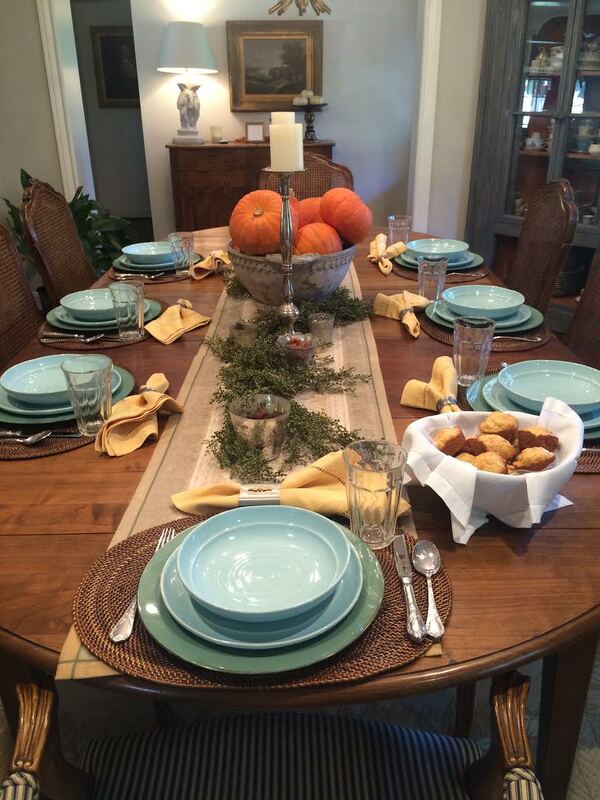 This week, we are going to pull up a chair to my mother’s fall table. Because…it’s official…fall is here. Well, it’s sort of here. It’s here in Houston in a theoretical sense if not in an actual sense. So all you fall-loving-people (myself included), pull up a seat, cut yourself a slice of pumpkin pie, and join the feast at a place where I have never failed to not only be fed, but also loved. Directions: brown the onion; add meat and cook until brown. Add the rest of the ingredients, juice and all. Heat until bubbly and enjoy! Everyone loves this stew! Salad Dressing: mix together 1/4 cup olive oil, 2 T balsamic vinegar, 2 T apple cider vinegar, 1 tsp dijon mustard. 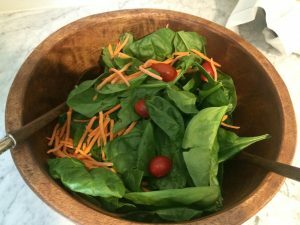 Pour over salad ingredients and toss when ready to serve. Directions: melt butter, add rest of ingredients and mix (I do this by hand). 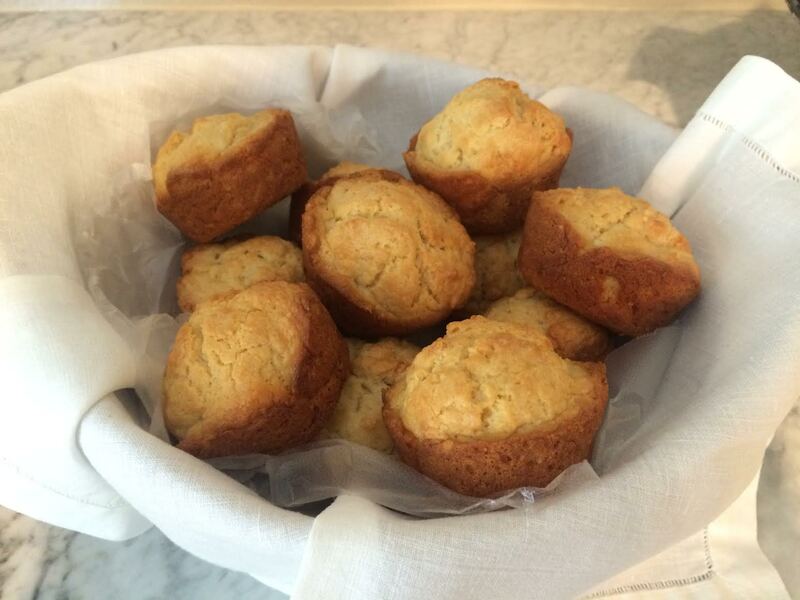 Plop into greased muffin tins (I use coconut spray oil) and distribute batter evenly. Cook at 350 degrees for 25 minutes. Serve with honey, preserves, or jam. I personally like Apple Butter for the fall. Directions: cream eggs, milk, and sugar. Add remaining ingredients and mix in well. Sprinkle sugar over the bottom of the unbaked pie shell, then pour filling into the shell. Bake at 400 degrees for 40 minutes or until a knife inserted into the middle comes out clean. Allow pie to cool before serving. 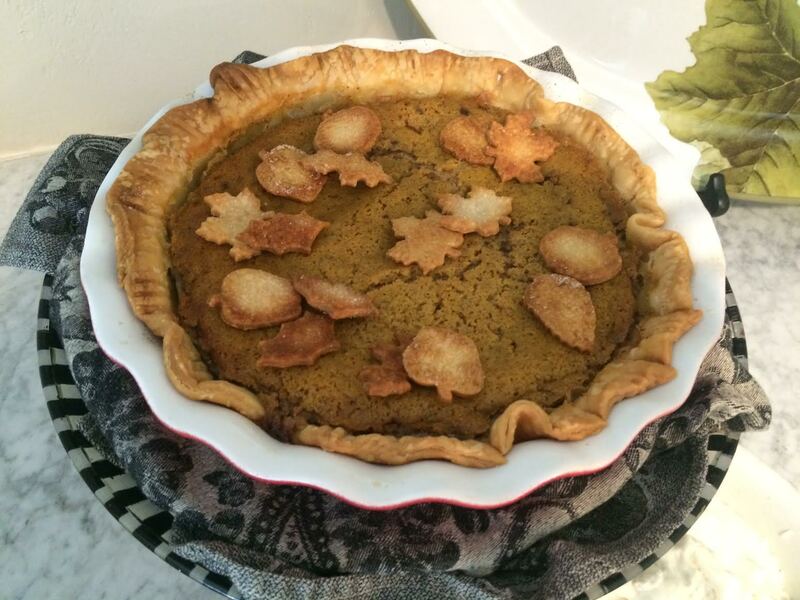 For decor on top of the pie, I use leaf cut outs from Williams-Sonoma. Cut out the shapes from the an unbaked pie shell, and place them on an ungreased cookie sheet. Sprinkle the cut outs with sugar before baking. Bake alongside of the pie at 400 degrees for 10-15 minutes or until golden brown. After the pie cools, place them on top of the pie. Directions: pour pint of heavy whipped cream into a bowl and beat on high. As cream thickens, gradually add 1-2 Tbs sugar and 1 Tbs vanilla. Whip on high until the cream holds its shape. Refrigerate until ready to serve. Serve pumpkin pie with whipped cream with a pinch of nutmeg or cinnamon sprinkled over the top. Delicious! Happy Fall! The fall table might be my favorite table to put together because it represents a time of year where my family can come together after summer vacations, a time when hot weather turns cooler, and a time when orange pumpkins grace the table as decorations and in the food we eat. Using my table to create the beauty that God has provided not only is a draw for family gatherings, but represents to me a little bit of the heavenly beauty that we will all experience together someday, in our exquisitely beautiful heavenly home where we will all feast around God’s table in perfect love and harmony. A large bowl for the centerpiece, purchased from an online site called Wisteria. I find they have unique pieces that are reasonably priced. I love this bowl because it’s lightweight (even though it looks heavy) and it can be used all through the year. I just change what I put in it. 18 inch tall candle sticks to go around the bowls. My candle sticks are silver-plated, purchased from Pottery Barn a few years ago, but use what you like. Pewter, terra cotta, brass…whatever you have will do or whatever your eye loves. I’m sure Round Top has some doozies that would grace any table beautifully. For those of you in Houston, MAI also has some nice ones if you don’t want to wait for Round Top. 4 inch pillar candles to go on top of the candlesticks. My candles are battery powered, and I purchased them from CostCo, but you can get them many places – Target, Lowe’s, Home Depot….or use the real thing. Here in Houston, Accessory Place has a good selection of candles, as does Hobby Lobby or Michaels. The votives are mercury glass purchased at Pottery Barn, but a website called Luna Bazaar usually has a good variety for an inexpensive price. I always think that an uneven number looks best (go figure) so I have seven votives of varying shapes and sizes. I think a variety of shapes and sizes is more interesting than having everything the same. In some I have dried fall berries, in some little dried pumpkins (not sure if these are real pumpkins or seeds that look like pumpkins) and in some, I actually put a votive candle. I purchased the little pumpkins at Round Top and the fall berries at an interior design store, The Accessory Place. Most likely, you can find these or some that you like at other places like Hobby Lobby or Michaels. Once purchased, you can place them in zip locks and save for the next year. A runner for the center of the table. This one is linen damask with leaves woven into the fabric, purchased at Williams Sonoma. I’ve collected different runners over the years that I can change out, depending on the season. The pumpkins in the bowl I bought at Whole Foods (a local grocery store), but Cornelius (a local nursery) has a large selection as well, with all shapes and sizes. 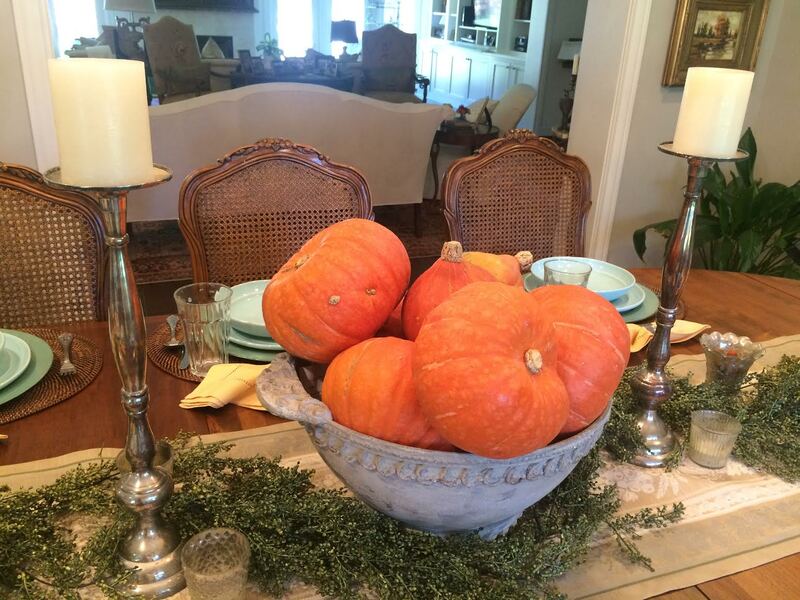 Put pumpkins in the bowl that have the size and color that appeal to your eye. I also stuffed the bottom of the bowl with wadded up newspaper. That way I had to buy fewer pumpkins. The greenery comes from Hobby Lobby. It is a garland made up of six different pieces, 26 inches total in length. Purchase however many pieces you need for your table, and then weave the pieces between the bowl, candlesticks, votives or whatever other pieces you have. I like this particular garland because it looks real, and Hobby Lobby always seems to have the best selection. For the place setting I started with a dark woven oval place mat I purchased from Pottery Barn some years ago, which can be used with many different place settings. The charger is a purchase from Hobby Lobby, a sea green color that goes with many of my plates. The dinner plate and soup bowl were purchased at Marshalls, and the glasses are the taller french jelly glasses. 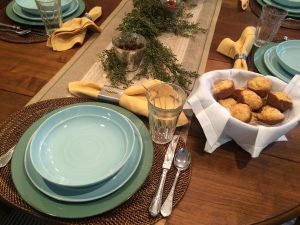 The yellow-gold linen napkins were purchased at Williams Sonoma years ago with pewter napkin rings purchased from Pottery Barn, using my everyday stainless silverware. Most of the pieces have been purchased over the years and are things I use frequently for my table, but the key is to collect things that you love and use them for your table to create your theme, using your centerpiece to set the theme and chargers that set off the place settings. Keep in mind that your table should reflect you. There’s no right or wrong. Just begin with what you have and add as you can. If I close my eyes, I can still picture the red sugar cookie tins from third grade Sunday School. My grandmother was the Sunday School teacher (she taught third grade Sunday School for over thirty years), and each week, she made sugar cookies to take to our class. The cookies were shaped as shepherd rods, stars, Christmas angels, fall leaves, or spring flowers and were used as the reward for those who had memorized their Scripture verse for the week. The very first Scripture passage we memorized was Psalm 23, and if I am still enough, I can feel the warmth from her knees next to mine, see her gentle eyes under brown rimmed glasses looking at mine, quietly and lovingly helping me to remember the words. Thanks to my grandmother and her red-tinned sugar cookies, those words have followed me over the terrain of the last four decades of my life. They have followed me through the valley of a broken engagement and two miscarriages. They have held me through college years and child-raising years. They have guided me through strong friendships and broken friendships. They have nourished me through times of hurry and times of rest. And they are now holding me through a season of watching a dear friend with cancer pass from this life to the next, leaving her three young children and husband behind. Those words, perhaps more than any others in the Bible, have made the reality of the Shepherd’s presence near and almost tangible. Why? I think it is because the words of the Psalm create a table not out of the Psalmist’s troubles, but in the midst of his troubles. This Psalm is a meant as a table in the wilderness for those who are on the way, rather than for those who have found their way. And isn’t that what all good tables do for those who sit around them? They do not so much eliminate people’s enemies as they make a place for people in the midst of their enemies. That’s what my mother’s table did for me. It didn’t take away the hardships of high school, but it provided a consistent haven in the midst of them. Does your family and community experience regular nourishment and nurture like that around your table? Do you open the doors of your home to weary pilgrims on the way who need a place to be refreshed from the enemies that war on their soul on a daily basis within and without? The people around our table don’t so much need to know that we can make every enemy go away and vanish (you might think they need that, but they don’t). What they need to know is that when the enemies of life come (and they invariably will), their place at the table is secure. And if you have young children, the lessons they learn from your table now, in the present, will transfer to what they understand and know about the table of the Lord in the future. There will be a day they will walk out the front door of your house to create their own homes and their own tables. But the place you secured for them at your table will be a place they will carry for the rest of their lives in the hearts. And however they sat at your table will be the way they most easily and naturally sit at the table of the Lord. Lord, the table You have entrusted to me is sacred space. Around it, You have brought specific people who need specific, tangible reminders of your constant, unconditional, covenantal love when walking through the wilderness. Give me the wisdom to know that every time I act as Hostess at my table, I am standing in Your shoes, giving people a taste of Heaven and of their Home to come. Help me not to take my role lightly or to treat it flippantly, but to give great thought to the tone of my table, the love it communicates, and the healing it brings. Don’t let me shun the role of a servant in my home, but enable me to take on the role of a servant, in order to make room for the Shepherd to heal and restore people’s souls. Begin today with restoring my soul at Your table, so that my table may be used in Jesus’ Name to restore others. It is in Jesus’ Name that I pray, Amen. To receive further encouragement on the kind of tables we want to set in our hearts and homes, connect with me this week on Facebook.